Free Eurail passes: Will you tattoo their logo on your body? A thirty year old Australian man receives two free Eurail Passes by permanently marking himself Eurail’s biggest fan. You’re next. Grant Burton wanted to give his parents a special 40th wedding anniversary gift in the form of two Eurail Passes. Currently unemployed, he came up with the idea that he would tattoo the Eurail logo on his body to see what kind of interest it might stir up. Burton’s inky imagination caught Eurail’s attention – they’ve given his parents free passes. In fact, Eurail.com has taken Burton’s idea and come up with a promotion where all of their customers can participate in similar scheming. According to Chantal Sukel, Campaign Manager of Eurail.com B.V., “[To allow] more enthusiastic fans to live their dream, we will launch a campaign around Grant’s idea. From February 15, everybody can post us their story or idea for ‘Biggest fans Travel for Free’ on our website.” The most passionate and creative customers will earn a free Eurail Pass. 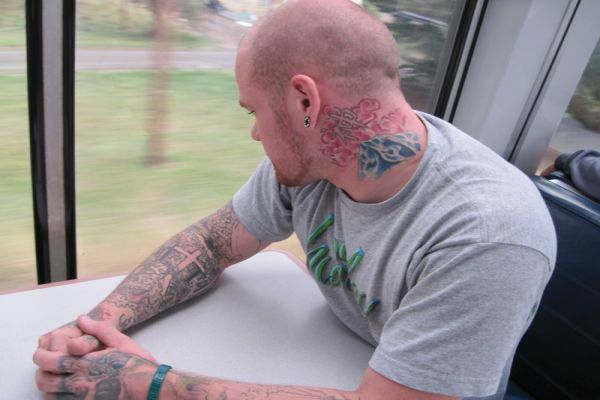 Burton hopes to travel with his parents this Fall to show his tattoo at the Dutch Eurail.com office. They’re offering to sponsor Burton’s trip if 5,000 people support him on Facebook. Which leaves us wildly curious. What would you do for a free pass? A company logo tattoo might not be your first choice for getting inked. Check out these tattoo conventions to discover some better ideas.